Having a 10-year relationship with someone means a lot to us. It carved something special to our heart and it gave wonderful experiences in our life. I know there is no perfect relationship, sometimes you failed your partner's expectations and sometimes your partner commit mistakes. But at the end, you never give up on each other. This is what I experience with my unique relationship with Cebu Bloggers Society. After all, this premier Blogging organization in Cebu was born on a love month, February 14, 2008, specifically. And on March 3, our grandest appreciation event will be held at Cebu Parklane International Hotel on a formal Gala night. Exciting my loves! Cebu Bloggers Society celebrates 10th Anniversary at Cebu Parklane International Hotel for their Gala Night. In this very special article, I am featuring my friends and members of Cebu Bloggers Society who made it up to this year. Indeed, it was a rocky ride but we made it through the rain. I'm sure with these pillars, CBS will live long. So I asked them, "Why did you choose to remain as a CBS member for 10 years?" "So easy. I'm part of the core formation group in its infancy until it has become the premier blogging organization of the South up to this very day. It's hard to let go when you found a lot of friends sharing the same passion, blogging. This group which serves as my family is unbeatable and has been tested through time. It's so far my "longest" relationship than any partner. :) "
Agnez Jimenez and her family. Agnes has been with CBS for 10 years already. "I stay loyal to CBS because it helped me further my career in freelancing. I learned a lot of things in the organization when I was still an active member and I am forever grateful. I hope it will continue its reign as Cebu’s premiere blogging group and will continue to help more people better their lives and career through blogging." "As one of the fortifying bloggers in CBS' infancy years, it's each member's commitment that'll foster of what is CBS now. I'm committed to stay and help, as the organization grows, we, members are also part of it." 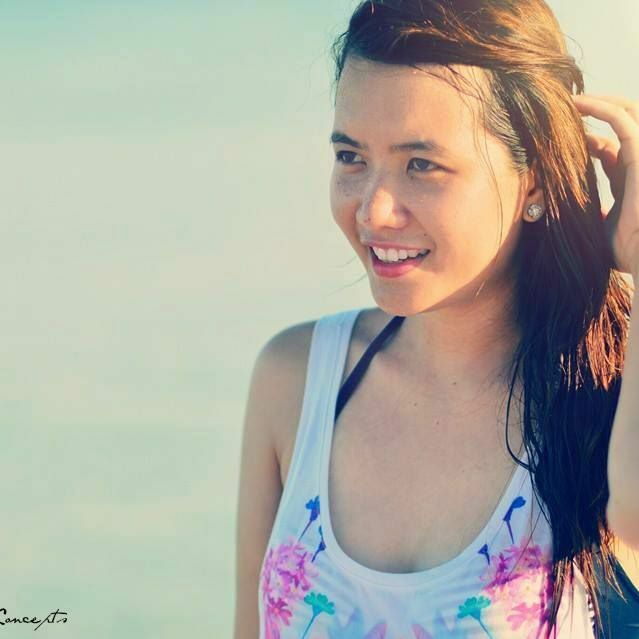 "10 years after, why am I still a member of the Cebu Bloggers Society? I joined in August 2008 as a shy high school graduate that was new to blogging and wanted to be with like-minded individuals. Indeed, the group, especially the pioneering members, helped me out, and together we faced the obstacles that challenged us, given that it was a new form of media and self-expression. But as the days passed, this organization became family. I grew up with CBS and the group has helped me step out of my comfort zone and achieve personal milestones. From someone who was shy and reluctant, I have developed renewed confidence, as my role for the group continues to grow. Today, the Cebu Bloggers Society remains to be the most trusted and this is reflected by the members' confidence in CBS as the premier blogging organization in Cebu. Padayon, CBS!" "Cebu Bloggers Society believes in the sets of principles that I personally subscribed to as essential values in developing the blogging and content creation community in Cebu. Making a choice directly stemming from what is truly important is always easier since CBS and I hold the same core beliefs. It is through the organization I am able to capably contribute to the promotion of Cebu and its lifestyle. 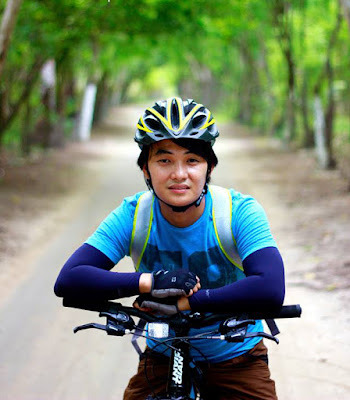 CBS has effectively produced top notch bloggers as harbingers of the good life in Cebu." The success of CBS is nothing without its members. And of course, new members have contributed a lot to the organization too. Do you want to know their inputs? I shot them one question, "As a new member of Cebu's premier blogging organization, Cebu Bloggers Society, what have you learned so far from the group?" " Getting to know like-minded individuals helped me improve my blogging skills. it also introduced me to the world of Cebu Events and Entertainment which I never knew existed even after living in the Island for the past 10 years. It's not all fun and games. There are deadlines to meet. Commitments to fulfill. Research to be made. These are the things that resonated when I joined CBS." "My membership application to Cebu Bloggers Society has approved February of 2016. I was blogging for 8 months already that time but it was nothing compared to others who are in the industry for 8 years. I am so grateful that they accepted me despite the lack of experience. I learned a lot from them, and for the first time in a long time, I felt that I belong. It’s good to surround yourself with people with the same interest and goals. I learned so much about blogging technically with the free workshops that the organization provide, and from the experiences as part of the organization. I also learned about friendship, not just having fun but deep relationships with my co-bloggers from CBS, I know I can count on them. I love this family, and I am so happy to be here now to celebrate its 10th year anniversary. Congratulations to the founder, Mark Monta and to the people who are here since 2008." "I have learned that there’s real beauty in diversity. I mean we have different personalities and we tackle different niche, but all together we create difference and change. And I think that is really beautiful." "I had doubts before applying to any blogging organization before because I want to start my blog from scratch but I was encouraged to join by Libotero (now Sinjin.Life) 😂. So I said, “Why not?” Now, I don’t regret that 2-year-old decision. There may be issues, frenemies, and misunderstandings (a thing that blogging/ influencer world will never run out of) but there are also to be gained and acquired best friends and connections. I wouldn’t have met my Besties (Guada, Mark, Lyssa), BIBES and Beshie Etienne. It would be a lie if I say my blog did not grow bounds because of Cebu Bloggers Society and I’m eternally happy and thankful for that. So, cheers for the AUTHENTIC 10 years of the premiere blogging organization: Cebu Bloggers Society! #CBSForever"
" Being with CBS is a continuous learning experience but something that stood out for me was I learned to co-exist with people who share the same craft as me - who, in their own ways, better themselves with each and every output they produce. There will come a stage where you would look at it as a competition on who gets a spot on this event or who gets invited by this PR or who's better at this particular niche. But, in the end, it will not always about that. I learned that I am a member of CBS because I love the craft of blogging and not the act of competing against one another. Because of that, I came to appreciate the people who love it just as I do. I learned to share what I know and the best reward is that I learned from other bloggers, too. " "I am honored and proud to be one of the members of Cebu Bloggers Society. In this group, I am able to expand my connections and widen my horizons. I have been exposed to the things that are out of my comfort zone. With that, I am able to express myself in an artistic way and share my passion and knowledge creatively very much better than before. I am truly grateful to be part of this group." "I've been with the group for some time now, and I've built not just my blog, but friendship among other members as well. I've learned how to grow my blog and establish good blogging practices. I've had the opportunity to attend events that were also contributing to my blog's audience. I couldn't be more grateful for this family who has given me no less than love and support in my every endeavor. Viva CBS!" Overall, I still believe that when we work together, we can do everything and we can overcome every obstacle. I hope that the old members will still support the organization in every strength and intellect they have. And I believe that new members can still show their leadership and talent to the organizations which for sure help them nurture to a better person. I'm so happy of what I built out of love and I wish for a better Cebu Bloggers Society in the future. The last ten years have been a long rollercoaster ride full of ups, downs and in-betweens for the Cebu Bloggers Society. Those years were filled with memories, challenges, learnings, and growth. 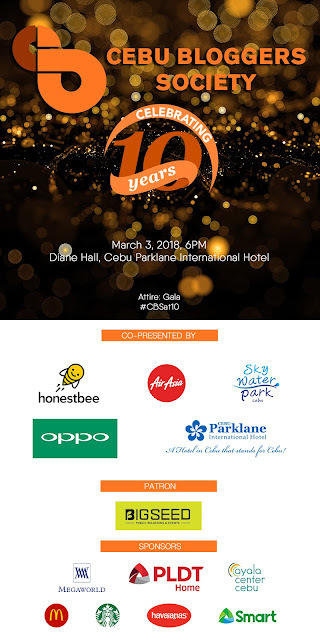 As CBS marked its 10th anniversary last February 14, we will be celebrating such a wonderful feat this Saturday, March 3 at the Cebu Bloggers Society 10th Anniversary Gala Night.. This event will be our largest event yet, and this wouldn't be possible without the support of our members, and the brands, PR agencies, companies and everyone who continued to trust and believe in the Cebu Bloggers Society. The Cebu Bloggers Society 10th Anniversary Gala Night is co-presented by Cebu Parklane International Hotel, our official venue partner, AirAsia, our official airline partner, SkyWaterpark Cebu, our official waterpark partner, and Oppo, our official smartphone partner. Have some cravings? You can now order your food and groceries online with https://www.honestbee.ph/en/. Just download the app and have them delivered at your doorstep. We thank our patron sponsor, BigSEED PR and Events for introducing the Cebu Bloggers Society to their partner brands. Starbucks Havaianas This event is powered by Smart. For more updates on the CBS 10th Anniversary Gala Night, check out our social media channels: Facebook, Twitter, Instagram , using the official hashtag, #CBSat10.